Ever since I moved to Minneapolis and started working at Exosite, I’ve been using R almost daily to get to the bottom of ops mysteries. Sometimes it pays off and sometimes it doesn’t, but it’s always interesting. Here’s an enigma I recently had the pleasure to rub some R on. One fine day, after a release of Portals (our webapp that lets you work with data from your cloud-enabled devices), I noticed something odd in the server metrics. The 90th-percentile response time had increased by a factor of four! Oh whoops — I should have warned you not to be drinking water when you looked at that graph. Sorry if you ruined your keyboard. Apache’s 90th-percentile response time is way higher than PHP’s. Like way higher. What gives? 90th-percentile response times, as reported by Apache, have climbed above 5 seconds, which is much higher than normal. PHP response times have not experienced any such climb, so something Apache-specific is causing this behavior. Median values were not affected for either metric, so this issue is only affecting a particular subset of traffic. Now it’s time to do some R.
This disagreement between Apache response times and PHP response times is really intriguing, and might hint us toward the origin of the issue, so let’s dig into it. Now that we have a nicely formatted data frame (we would also have accepted a pretty flower from your sweetie), we can use ggplot to check it out. So we can see here that most of the requests are doing what we expect: getting sent to PHP as soon as they come in, and getting sent back to the client as soon as they’re done. That’s what the blue line indicates: it’s a line of slope 1. But then we’ve got this big near-vertical chunk of weird. Those are requests where PHP finished quickly (consistently under 200 milliseconds) but Apache took much longer to serve the request (up to 35 seconds). What is Apache doing for so long? Why can’t it just serve content like it’s supposed to? Now we’re getting somewhere! Look at all that green. That means that this issue is limited to a particular domain: baz.exosite.com. "Mozilla/5.0 (Windows NT 6.1) AppleWebKit/537.36 (KHTML, like Gecko) Chrome/30.0.1599.37 Safari/537.36"
So what are we looking at? Here’s what I think. Only one person, let’s call him François, uses this domain. François has a Portal with several auto-refreshing widgets on it. Also, François is on a train, and he’s using a wireless access point to browse the internet. François has his Portal open in a tab that he’s forgotten about. It’s dutifully refreshing his widgets every few seconds, but as the train moves, François’s access point keeps switching towers. It starts getting a weak signal, it switches towers, François’s IP address therefore changes, and repeat. PHP only logs how long it took to execute a script on the server, but Apache logs how long it takes for the client to acknowledge receipt of the final TCP segment in the response. 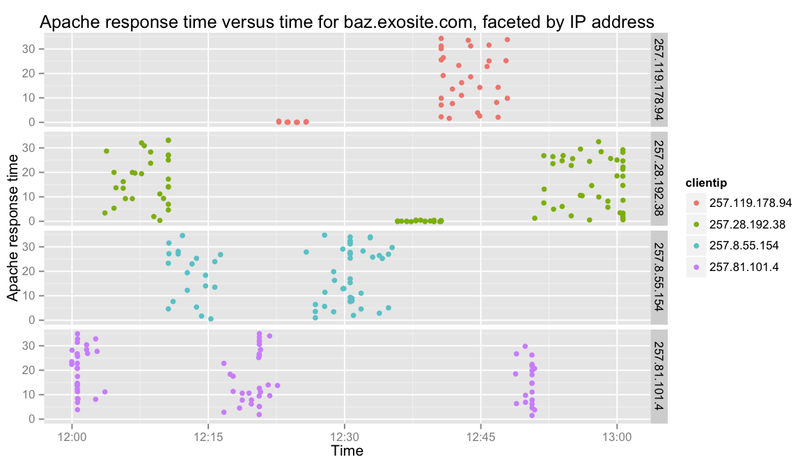 Since François is on an ever-changing series of unreliable networks, he’s dropping packets left and right. Therefore, Apache is logging response times all over the map. Alas, this information is useless. Sometimes that happens: sometimes you dig and dig and learn and learn and prepare your beautiful data, only to find at the last minute that it was all for naught. But at least you learned something.